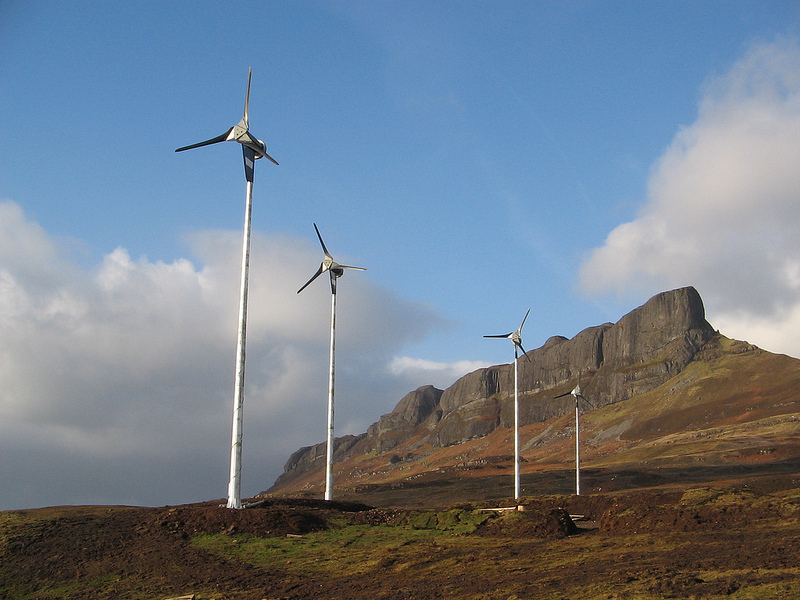 Wind turbines on the Isle of Eigg, which generates 85% of its electricity from renewable sources. Photo: Isle of Eigg community. Climate policy can help to reduce our dependence on fossil fuels - firstly by reducing energy use through energy-saving measures, and secondly by diversifying the energy supply to include a mix of sustainable sources. This can deliver co-benefits including lower and more stable prices for energy services in the long term, reduced expenditure on fuel imports and safer, cleaner energy. Cutting our reliance on fossil fuels will help to avoid the damage associated with extracting, processing and transporting them - including oil spills such as the Deepwater Horizon disaster, coal mine accidents, gas leaks and the visual impact of opencast coal mines (especially for 'mountain-top removal'). There are a number of potentially significant conflicts between climate policy and the goal of providing safe, secure energy. Carbon capture and storage exacerbates energy security problems because it increases fossil fuel consumption per unit of delivered energy by 25%. A high share of variable renewables such as wind and solar presents a challenge for balancing supply and demand. This can be tackled by encouraging a diverse mix of renewable sources, and investing in energy storage, electricity grids, control systems and smart demand management. Nuclear power can improve energy security provided that uranium supplies are secure, but it has other safety and security impacts including the risk of weapons proliferation and terrorism, the risks of nuclear accidents and the problems of long term waste disposal. Fourth generation reactors could help to improve these problems in the long term. Fossil fuels are becoming increasingly scarce and expensive, but if we turn to unconventional sources to solve our energy security problems we risk becoming locked in to an unsustainable energy infrastructure, as well as suffering increasing environmental damage. Reducing our reliance on fossil fuels can help to provide a safer, more secure and more affordable energy supply in the long term. There will be high initial investment costs, but in the long term the costs of renewable energy will fall while the costs of fossil fuels will continue to increase.